I was recently involved in field work aimed at assessing the micronutrient status and monitoring exposure rates to potentially harmful elements in western Kenya. 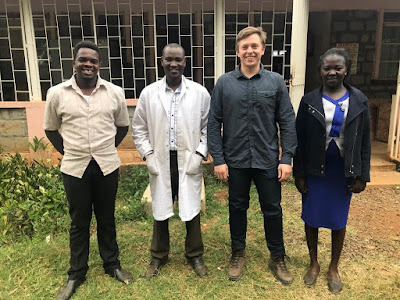 Michael Watts, Andy Marriott and I visited the University of Eldoret, Kenya for a 16 day fieldtrip that would consist of us collecting environmental and human biomonitoring samples from over 90 households in western Kenya. For more information see the earlier blog: Geochemistry and Health in the Kenyan Rift Valley.This was my second trip to Kenya for fieldwork, the first being in January earlier this year. During the sample collection phase of the trip, we were based in Kerichio before moving to Kisumu, located on the edge of Lake Victoria in Winam Gulf; Andy would remain there at the end of our sampling trip for a project of his own investigating aquaculture in Lake Victoria, more to follow in a future blog! Our field teams consisted of 3 vehicles led by Michael, Andy and I alongside our collaborators; Professor Odipo Osano (University of Eldoret), Dr Diana Menya (Moi University), technical lab staff; David Samoei and Doreen Meso (University of Eldoret), drivers and field assistants. In addition to the field teams, we also worked with public health officers (PHO) from each county who assisted with household entry, sample collection and translation. During the fieldwork, we provided training to our partners on how to collect environmental samples and all the necessary information from each site, with particular focus on accurate record keeping. After 5 days in the field, we had collected more than 800 samples and it was time to get back to the laboratory in Eldoret to process them! Once in the labs at the University of Eldoret, I provided training in sample checking and processing. In addition to David and Doreen, who helped in the field, we were also joined by MSc student Job Isaboke and 6 undergraduate students studying environmental science. Having both David and Doreen with us in the field and laboratory provided them with a greater understanding of the importance of quality assurance and in turn, they can enforce it in their students. In terms of sample preparation, all the fresh fruits and root vegetables had to be peeled, chopped, frozen and vacuum packed, which took 4 people all day to get through! The leafy vegetable material was dried and packed for transport whilst the grains/beans/pulses and nuts were ground, a task that we could not have completed without the help of all the students. Finally, the soils were riffle split, allowing us to bring back a small amount of soil for analysis at BGS and to leave the bulk of the soil in their archive for future student projects at the University of Eldoret. One of the most important tasks I had to complete was ensuring that all the data we collected was handled properly. Showing our partners how to handle data collected from the field is essential to their development and ability to collect samples independently in the future. The partnership with the University of Eldoret has been going for over three years; in addition to multiple sampling trips in Kenya, David visited the UK for two months of lab training under a Commonwealth Professional Fellowship (See previous blog: A model for Quality Assurance, Lab Management and Good Laboratory Practices for Africa). Based off of the success of this trip we are looking forward to welcoming both Odipo and Doreen to BGS for training in 2019. Overall, the sampling trip was a success, and we now feel confident that we are developing our partner’s skills to the point where they can venture into the field and collect samples in areas that have been missed to strengthen the work. The field work was very enjoyable and productive, I can’t wait to work in Kenya again, keep an eye out for future blogs!